This sculpture is called 'Life Times'. It was made in memory of a local man who had a great love for parks, dogs and children. The sculpture was commissioned in his honor. 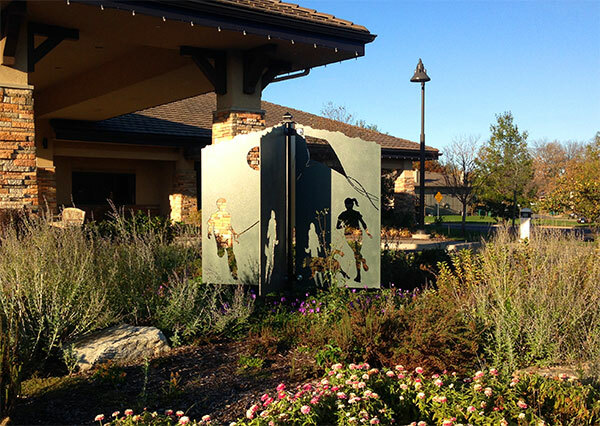 This public art is located at the entrance of the Gamber Center in Lee's Summit, Mo. The sculpture is made up of four large panels. Scenes that depict children playing, running, swinging and flying kites are cut from the steel. The idea is that throughout the day and seasons, light and shadow will change constantly on the sculpture. So, no matter from what angle you view the piece, it looks different. The sculpture is situated in the middle of a beautiful flower garden that is managed by Master Gardeners of Kansas City. The piece is anchored to a large concrete base. The heavy steel panels are bolted to the center post. A simple sign tells visitors about the sculpture. The panels are powdercoated with naturalistic colors.